Martha Dandridge was the oldest of nine children, three brothers and five sisters who grew up on the Chestnut Grove Plantation in Virginia. When Martha was 18, she married Daniel Custis, and had four children. Two died in childhood, Patsy lived to 17 and Jacky lived to 26. 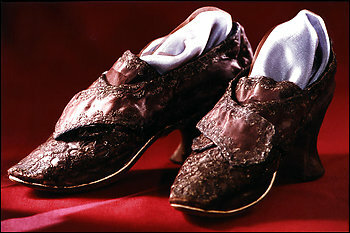 While their children were still young, Daniel Custis died leaving Martha a very wealthy widow. Martha had two suiters for her hand. One, a very wealthy planter, and the other a young army officer with a modest farm. Martha chose the handsome army officer, George Washington. Their wedding was splendid. George wore a suit of blue and silver. His handsome bride wore purple shoes with silver studs. They danced the night away. Martha loved caring for George and his home. She raised her children and ran her home in a gracious manner. When George was Commander in Chief of the Continental Army, Martha joined him in the field. Her presence reassured the troops. Martha's son Jacky served in the Continental Army, but died of typhus in camp. 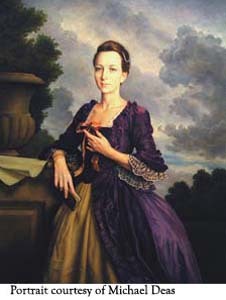 Jacky's children went to live with their grandparents, Martha and George Washington. When George Washington was elected the first president, Martha accompanied him to New York. Martha was a gracious hostess and helped smooth some of the roughness from the new government. After his second term as President, George and Martha retired to Mount Vernon. Martha continued to care for her beloved husband and was at his side when he died. 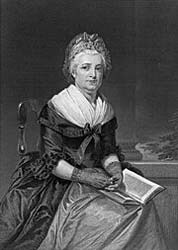 This portrait of Martha Custis Washington has an interesting story. Author Patricia Brady was concerned that most picture of Martha showed her as an older woman, a little plump, and a bit frumpy. Her research indicated that when Martha married George Washington, she was slim and beautiful. So, to have an authentic picture of Martha for her book, she had a good portrait of Martha regressed by computer to show what Martha looked like in her twenties. The portrait at the left shows the result created by portrait artist Michael Deas. Page created February 5, 2009. Anne Pemberton. Updated Sat, Feb 11, 2012. AP.